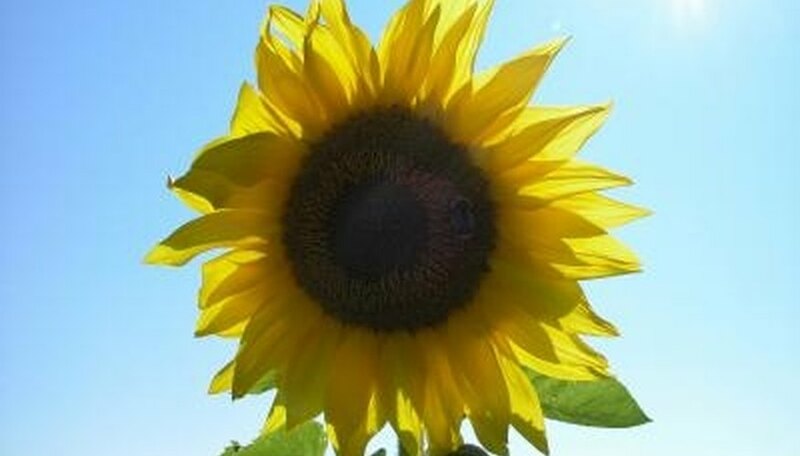 Sunflowers are easy to grow and they've been cultivated as a crop for around 3,000 years. However, they are susceptible to at least 30 different diseases caused by fungi, bacteria and viruses. The five most serious diseases are all caused by fungi and, of those, three of them cause black spots to appear on the leaves. Rust causes small cinnamon-colored raised spots to develop on the leaves of infected sunflowers. These blisters usually first appear on the bottom sides of the lower leaves, but they can also show up on bracts, petioles and stalks. Leaves with a lot of spots may wilt and the spots may run together to form large, irregularly shaped areas of infection. A yellow border may also surround spots and the spots turn black late in the season. The black spots are the overwintering stage of the fungus. Once they appear, that infection is over for that season. Sunflowers are more susceptible to rust infections when the temperatures are warm and there's water on the leaves. Leaves only have to be wet for two hours in order to become infected. Because rust spores can survive in plant debris from the previous season, sunflowers shouldn't be planted in the same place two years in a row. Avoid high-nitrogen fertilizers, which encourage the growth of a dense canopy that will trap dew and keep the leaves wet. Plant hybrids that are resistant to rust. Consult your local county extension for advice about chemical control, since fungicides don't have federal approval for use on sunflowers. Symptoms of alternaria leaf spot include dark circular spots on the leaves. Sometimes the spots run together, causing the leaves to wither and die. Some spots may have yellow halos. Dark streaks, flecks or diamond-shaped spots may appear on the stems or petioles. Sometimes these lesions can cause the stem to break. Dark spots can also appear on the back of the head. Alternaria infections are worse during warm, wet weather. Control alternaria by removing infected plant debris and burying it. Rotate crops. Fungicides aren't usually necessary but, when they are used, they should be applied when lesions first appear. Phoma black stem is the most common sunflower disease, according to the National Sunflower Association and is caused by a soil-borne fungus. Symptoms include the appearance of large dark spots on the stem. Spots can also appear on the back of the head and at the axil of the leaves, making the plant look wilted. A black area may encircle the stem at or just below the soil line, causing the sunflower to die. Phoma black stem is worse when there's wet weather during flowering. This fungus is spread by the wind and by splashing rain and irrigation water. Rotate crops on a four-year basis with crops, like small grains, that don't serve as a host for this fungus. Control stem weevils to reduce their ability to spread phoma. Plant hybrids that are more tolerant to this disease. No fungicides are registered for use on this disease. Purdue University Alternative Field Crops Manual; Sunflowers; D.H. Putnam, et. al.